preservation and restoration of the Hugo Union Pacific Railroad Roundhouse. All blends are made from 100% Arabica coffee and come in 8 oz. bags (226.8 grams). An all around coffee for any time of day or occassion. Created to capture the robust spirit of an early 20th century railroad yard. 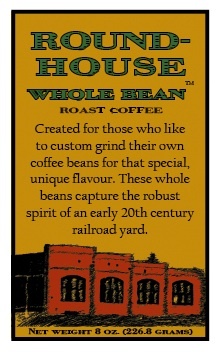 For those who like to custom grind their own coffee beans for that special, unique flavour, there is Roundhouse Whole Bean coffee. 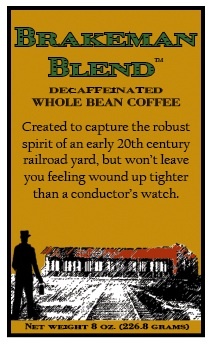 The same great blend as the Roundhouse coffee, but this one is decaffienated so it won’t leave you feeling wound up tighter than a conductor’s watch. 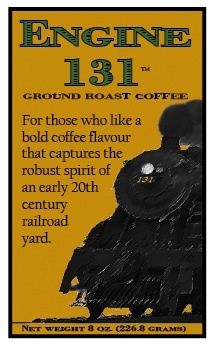 For those who like a bolder coffee flavour that captures the robust spirit of an early 20th century railroad yard. Named after the steam engine that was a regular workhorse at the Hugo Roundhouse and was a familiar sight as it moved other engines and railroad cars. 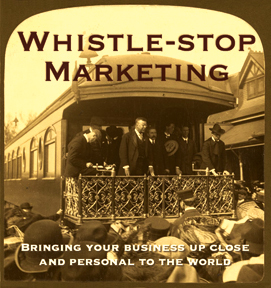 Whistlestop Marketing had an idea to generate funds for the Roundhouse Preservation. The plan was for a way to provide an ongoing source of income year round from a product that was related to the mission of the organization. Coffee seemed to be a commodity nearly everyone used anyway and is used year round. 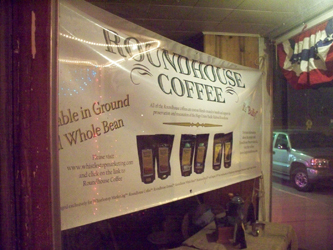 Roundhouse Ground had a nice ring for a name and the quest was on to find a roaster that would create a custom blend just for the project. It was decided that a decaf version of Roundhouse Ground was needed so it was given the name Brakeman Blend. Since there were already two versions of the Roundhouse blend (Ground and Whole Bean), a different name seemed the answer. Samples were acquired, artwork was created and labels designed. the idea was pitched to Roundhouse Preservation Inc. and approved. At a subsequent meeting samples of coffee were tasted and the blends were selected. The organization had an idea for a name, honoring the locomotive that was most associated with the roundhouse during the working years. Engine 131 became the second blend to be selected. 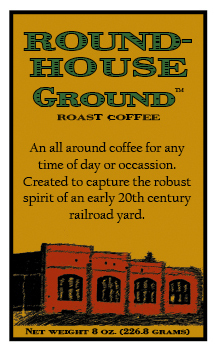 So today everyone is able to enjoy this great coffee and help to further the work of the roundhouse preservation. Order a bag or two today! about the roundhouse and see how the restoration is coming along. 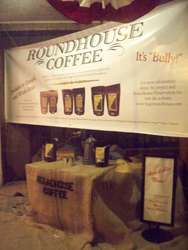 Roundhouse Coffees make their public debut at the Lincoln County Ranch Rodeo. Roundhouse Ground was served at the concession stand. "I'd like a cup of Roundhouse Coffee please." Received great coverage from the local radio station KHIH 93.7 FM.